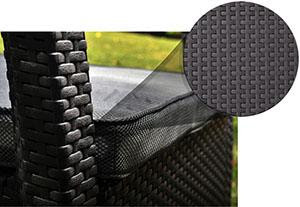 Keter Plastic Ltd. is one of the world’s leading manufacturers and marketers of resin-based household and garden consumer products. A one-stop-shop for plastic storage, organization products and furniture, Keter strongly believes in improving people’s daily living. 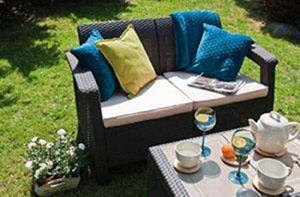 Why buy our Keter Outdoor Furniture? 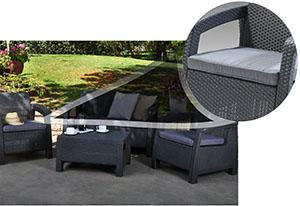 The upscale look of rattan furniture with the robust resilience of Keter’s polypropylene resin construction for maintenance-free patio seating with a woven texture that will not fray, fade or peel. 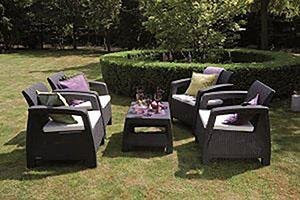 The Corfu Armchair and Loveseat include luxuriously thick, weatherproof seat cushions that tastefully accent the rich rattan brown or the cool contemporary tones of the grey. 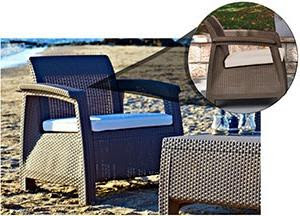 Ergonomically engineered for ultimate comfort, the ergonomic armrests and reclining, cushioned seat backs ensure you will enjoy your Corfu seating all day long! Create a romantic cozy getaway space just for the two of you. The Keter Corfu Loveseat pairs nicely with the Corfu table or other patio table to create a nest to chat and unwind together. Arrange your ergonomic Keter Corfu chairs into a variety of creative groupings around the Corfu Table and encourage your friends to mingle in relaxed comfort at your next gathering. 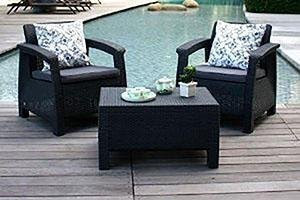 One or two Corfu Chairs and Table fit nicely into any smaller outdoor or balcony space and give you a cozy peaceful place to curl up in comfort the next time you want to escape into a good book.